A little spin on a Favorite! Happy for Polka Dots and Paisley! I just can't get enough of this set, it is one of my absolute fav's! The Signo Gel Pen is just perfect for filling in the paisley's - really makes them pop off the page instead of disappearing into the background. I used Very Vanilla, Elegant Eggplant and Tempting Turquoise - wow what a color combination! I haven't used it in forever and thought it would look great with this set and boy was I right. I stamped Linen using Elegant Eggplant over the Paisley's - gives it lots of texture. Added some dimensionals, stickles to the flowers and LOTS of ribbon (you can't go wrong with dimensionals and ribbon). When I got home yesterday from work I had two packages awaiting me - woohoo - I love to get goodies! The first package I opened contained one of my favorite things - Cindy Ribbon! I get some of the most amazing ribbon from Starlit Studio (Cindy Lyles). She has so much to choose from and her prices and service are great. 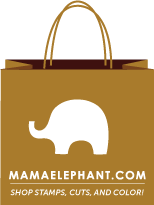 I buy from her all the time, she is top notch! 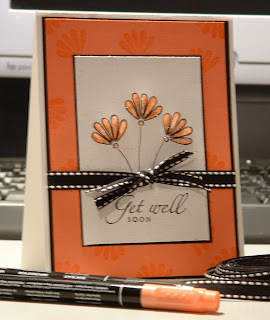 My other package contained Basic Grey Blush paper from Eclectic Paperie - I got their website info. from Taylored Expressions and decided to check them out..........their prices are reasonable and their shipping - super fast! 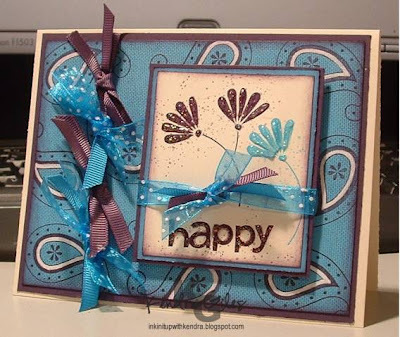 Oh and one other place you should check out is my good blogging friend Christie's website - Paper Pretties - card kits in a box delivered to your door - with the stamps included - and not just any stamps, but the adorable Stamping Bella stamps! Go and sign up for your card kit in a box today! Have a wonderful Tuesday! Just a little Cuttlebug Love! Watermark! 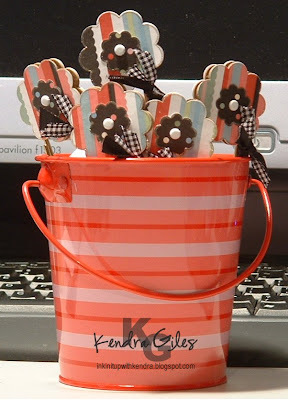 Thanks to Cindy Keery, a really good blogger friend of mine, I now have an amazing watermark to put on all my creations!! THANKS GIRL! She can make one for you too - she charges a very small fee to make these - I JUST LOVE MINE! Just click on her name and it will take you to her blog where she has a special section called "watermarks". Go check it out - you will be glad you did! 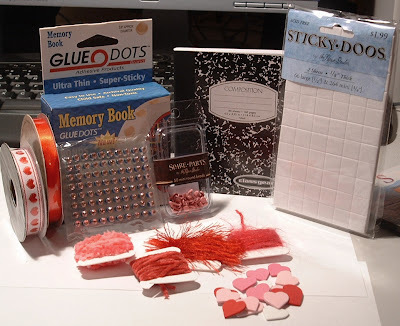 It's Time for some Blog Candy! Yep, that's right - I have had over 10,000 hits on my blog (WOW!). I have only had my Blog up since November and can't believe I have already had that many hits - it's amazing! Thanks to all of you who subscribe to my blog, visit me daily and leave me such super nice comments and emails! I have a very talented person working on a banner for me - It is going to be sooooo cute, can't wait for her to get it to me. :) I have had several people ask me about my distressing/sponging technique........I distress the paper then I sponge on the ink. :) Now on to the info. about the candy: Leave me a comment and let me know why you like visiting my blog and if there is anything you would like to see me touch on involving stamping or whatever else. :) On Friday morning I will draw the lucky winner! 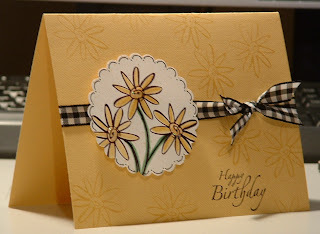 Birthday Bouquet for my Card Stash! Hi, I'm Kendra and I'm Addicted to Like It a Latte! I made these cute little 3x3 cards to go into one of the Target Mailboxes I will be working on - hopefully this weekend. (yes, I was lucky enough to find some super sweet ladies on SCS willing to send me several of those!) These are the first 3x3 cards I have ever made and I gotta say, I like the size of them and will definitely be making more. I am still in my white cardstock mode (don't know when I am gonna get out of that lol)!!! The lip stamp is from Hobby Lobby - got it quite a while ago and forgot I had it. 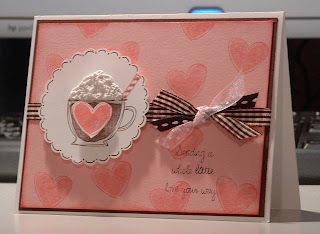 The heart is from the Like It A Latte set - I cut it out and it is up on dimensionals. I then sponged real red ink on the edges. We are getting some super nasty weather today and through the weekend!! The highs during the day will hover around 32 and at night will be in the teens........we are expecting ice/sleet/snow for the next several days! This is TEXAS people, 32 is pretty darn cold LOL I will be holed up in the house all weekend stamping and staying warm! I decided to post something other than a valentine card today! I know you are shocked LOL This is a card that I made over the weekend that I basically just threw together, but when I got finished with it - I LOVED IT! 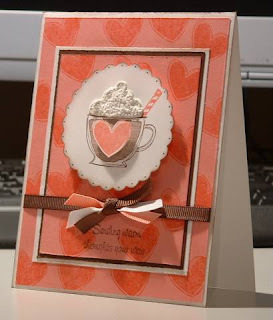 I didn't even use any layers - yes, I am a layer queen.....I like lots and lots of layers *grin* This card was ever so simple to make, yet turned out pretty darn elegant looking. 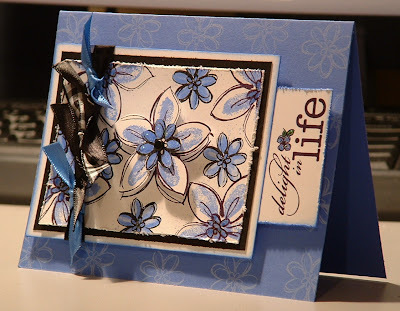 After I got the flower portion of the card finished I was looking thru my drawer of brads, bling, etc. and came across a box of big polkadot brads I bought at HL and thought that would be perfect for the center of the flower. The ribbon is black satin ribbon and is so pretty on the card IRL. I am definitely making more of these in different colors and bagging them up for gifts..............maybe valentine gifts for friends! Yep, I've Gone "Valentine" Crazy! Well, at least I can admit it. 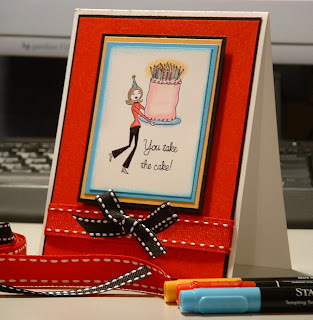 lol I am absolutely, positively enjoying making these cards! You will probably see several more on here before I decide to move on to something else. *smirk* Like It A Latte has got to be one my most favorite sets right now - the minute I saw it in the winter mini, I knew I had to have it - and then there is my scallop punch that I can't seem to pry from my fingers! I swear I could put one of these on every single card I make! 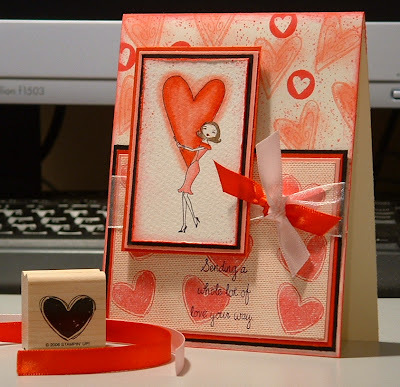 :) I made six of this particular valentine card - three with real red, three with pretty in pink - they all turned out even better than I had hoped. 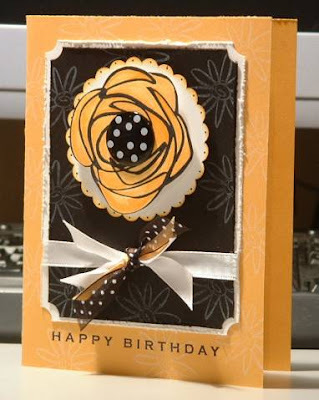 Adding a little layer of chocolate chip just made the card pop. The ribbon came from Hobby Lobby - you gotta love that 1/2 off ribbon by the roll they have had going on forever now - they have so many different styles to choose from! Oh and of course I can't forget the Tulip Puffy Paint for the foam - love, love working with this stuff! 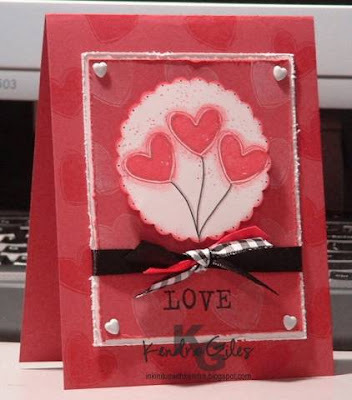 Yep, I'm still stuck in Valentine Card mode right now!! *snicker* I am getting so many made it is just crazy! 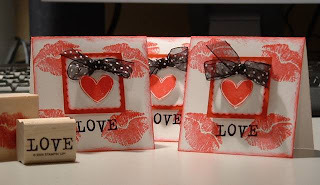 I figure while I am on a roll I should just finish all of them and have them ready for when Valentine's Day gets here. 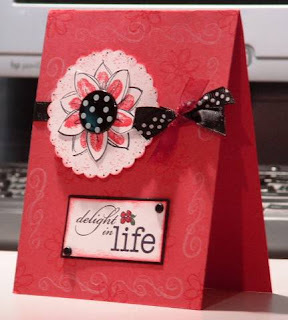 I just love red and pink together - one of my fav's! This one actually came to me when I went to bed last night and I tried to remember it this morning. It was super easy. 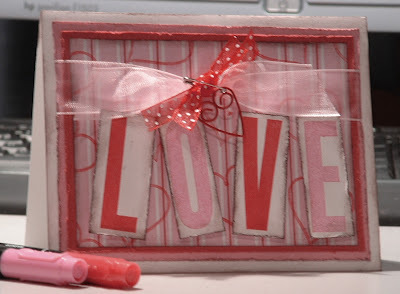 I distressed all the paper with my paper distresser, sponged the edges with chocolate chip ink, stamped hearts on the patterned paper with rose red, popped the letters up on dimensionals (love those things), added some ribbon and polished it off with a mini safety pin and heart shaped clip. It is exactly what I envisioned while I was creating it. I love it, I don't think I will want to give it away (well, I made more than one so I just might keep one for myself). 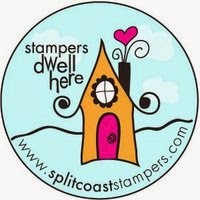 Well, I must get back to my stamping, ideas are swimming around in my head! A Little Mixed Bouquet Happiness! 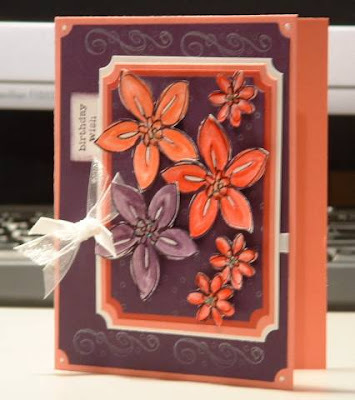 I finally got the Mixed Bouquet stampset I have been wanting for quite some time. I just love the flower sets, you can never have too many of those IMO. 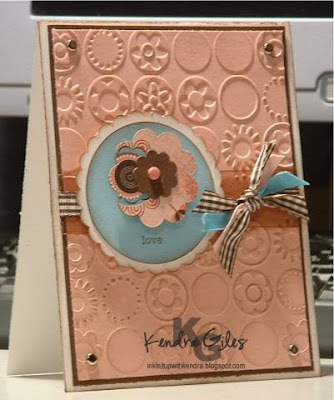 For this card I decided to go with the whisper white cardstock base (i know, i have been stuck on this lately.........I just love how it looks). Cool Caribbean and Real Red were screaming out at me, so that's what I went with. 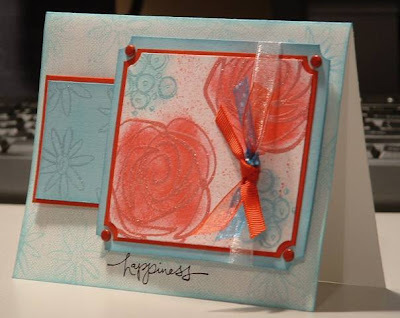 I stamped the roses in versamark and Real Red then used irridescent ice EP on them - they look beautiful! I then sponged some Real Red onto the flowers. 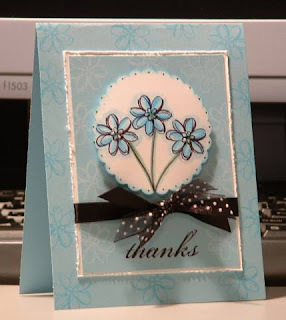 For the small flowers out to the side I stamped them in versamark and then used irridescent ice EP on them as well - they are sooooo shimmery! 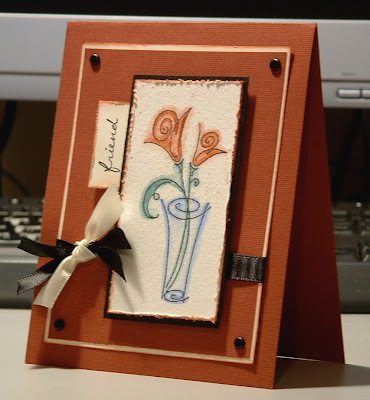 The background flowers are stamped in Cool Caribbean, stamped off first then stamped on the cardstock. Can I just say how much I love the SU! ticket punch? Well, I do - I try not to use it on everything, but it's almost impossible! LOL I added a few brads, some dimensionals and ribbon - VOILA! 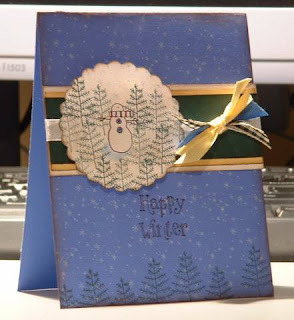 I am glad I made a few of these, because this card is actually for a friend! I hope you all are having a great day - the weekend is almost upon us! woohoo! More stamping! P.S. A real sweetie on SCS made me really happy today - Lyndie (also her SCS name) graciously offered to sell me some of her little $1 mailboxes from the Target Dollar Spot - she had a lot of extras. Our Target here does not have any of these adorable mailboxes (boohoo). Anyway, I sent her the money this evening and she is shipping them to me - i'm so excited! THANK YOU LYNDIE!!! !